What is the area (in mm2) of triangle A? 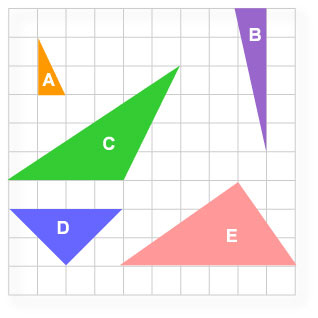 What is the area (in cm2) of triangle B? What is the area (in m2) of triangle C? What is the area (in mm2) of triangle D? Calculate the area (in mm2) of the triangle below. The triangles below are on centimetre grid paper. What is the area (in cm2) of triangle A? What is the area (in cm2) of triangle C? What is the area (in cm2) of triangle D? What is the area (in cm2) of triangle E?